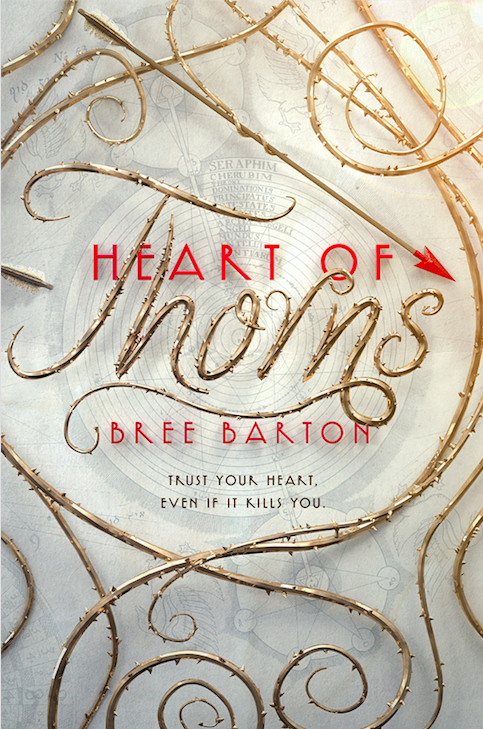 Today we are pleased to feature author Bree Barton and her debut YA novel, HEART OF THORNS (KT/HarperCollins 2018 July 31, 2018). Enter to win a copy! Bree is also running a Preorder Prize Giveaway, where you get a free bookmark and a sneak peak at Chapters 1 and 2 and are entered to win other prizes. Thanks for having me! I started writing stories when I was eight. Back then I wrote about teen characters because they seemed delightfully old. Now I’m the one who’s delightfully old! In some ways I think the stories we write when we’re young stay with us, maybe because they’re our first attempt at cracking open the coconut of the world. Case in point: when I was eleven I wrote my first fantasy novel—more of a novella, really—entitled The Island of CocoPux. The story followed a group of girls who flee an evil ruler and escape into the woods beyond the castle walls. Sound familiar? If you read the blurb for HEART OF THORNS, you’ll see why. 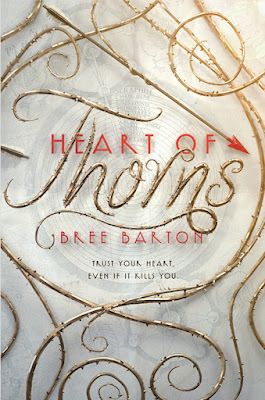 Congrats on your debut YA novel, HEART OF THORNS. Tell us about it and what inspired you. HoT was always about a girl who sets out to destroy magic—then discovers she has it. But that was only the skeleton. The flesh and tissue weren’t fully formed until after the 2016 presidential election. Suddenly I was thinking an awful lot about what it means to be a woman in a country that hates and fears you, a place where people who don’t look or act or love a certain way are oppressed. So I asked myself the question: What if magic developed in women’s bodies as a way to right the imbalance of power? What if that magic was why they were persecuted—but also how they could rise up and fight against it? From that primordial soup, HoT sprang to life. I just saw—and adored—Love, Simon, so I’m going to cast HEART OF THORNS using only those actors. Quin is definitely Miles Heizer (Cal). Fierce Mia has gotta be Katherine Langford (Leah). Sweetheart Angelyne is Talitha Bateman (Nora) in like two years. Tough-as-nails Pilar is Alexandra Shipp (Abby). And smokin’-hot Domeniq is Keiynan Lonsdale (Bram). Sorry, Nick Robinson: you don’t get to star in my movie, too. You're a ghostwriter. How has that experience helped you with your own novels? Ghostwriting has put so many tools in my toolkit: the ability to write on deadline, take feedback, and—perhaps most importantly—finish a manuscript. I remember being twenty-two and spending like three weeks rewriting a single paragraph. The first paragraph, no less. By week three I’d gotten so precious I was basically just rearranging punctuation. “What if…is it possible…should I use a semicolon instead of an em dash?!!? !” Nope. Ghosting disabused me of that habit, fast. Book Two of the HEART OF THORNS trilogy! I can’t say much, but there are ice caves, fog-cloaked lagoons, and magical creatures we didn’t see in Book One. I’m also putting the finishing touches on a magical middle grade novel I’ve dreamed of writing my whole life. I don’t want to jinx it by talking about it….but I can tell you it’s a book about a girl who suffers her first depressive episode at eleven: the age I was when I had mine. The book is funny, I swear! Zia (my MC) let me tap into my innate silliness, which can sometimes get tamped down writing fantasy. But the reality of depression is a big part of my life, so I cried a lot while writing it. I hope this book finds its way to kids who feel sad and scared and broken. I was that kid, and I want them to know they’re not alone. We’ve all heard sage advice like “Read a ton of books” and “Write every day.” Those things are absolutely true. But honestly, I think one of the best things I’ve done for my writing is to not write. Only temporarily, of course! Sometimes I need to refill the well by stepping away from my computer and doing something wildly different. I made a YouTube video about this, actually: How to Have a Writing Adventure. I also did a whole series about How to Beat Writer’s Block, including a bunch of crafty things I’ve done to unstick myself—ripping up my manuscript to make a collage, studying black-and-white photography, fusing glass, and even taxidermy. Working with images and tactile materials has been a huge boon to my creativity because it unlocks a different part of my brain. Not to mention it’s given me great story ideas. There’s a lit mag floating around somewhere with a story I wrote about my taxidermy class. When I first came to Los Angeles, I had a commercial agent, because that’s what you do when you move to LA. At one audition—for a San Diego tourism ad—I had to pretend to throw a bocce ball. That required a lot of panicked Googling on my two-hour drive to the studio, since I had no idea what a bocce ball was. I got a callback, so the next day I drove two hours again so I could pretend to throw a bocce ball to three other actors who pretended to throw the bocce ball back. I did not get the part. Thanks for asking! Mostly you’ll find me on Instagram and YouTube, where I post funny videos about writing and/or my dog (new vids coming after my book launch!). You can also sign up for my monthly author newsletter if you’d like free books, writing prompts, dance playlists, and a whole grab bag of delights. Bree Barton is a writer in Los Angeles. 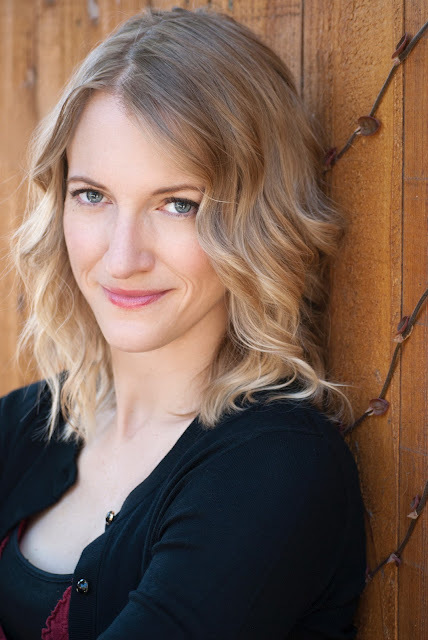 When she's not lost in whimsy, she works as a ghostwriter and dance teacher to teen girls. She is on Instagram and YouTube as Speak Breely, where she posts funny videos of her melancholy dog. Bree is not a fan of corsets. Great post! Looking forward to reading. I guess people "toss" rather than "throw" bocce balls? Anyway, sounds like a good fantasy book! I love the premise of this book and the choices your character faces are going to make for exciting hours of reading. This book sounds wonderful! Love all the layers. Congratulations! An article ought to have the right circulate. The top of every sentence ought to have connection to the start of the subsequent sentence. Except there's a break for paragraph this needs to be continued all through article. If you want to learn more about QandA then please click here or visit our website.